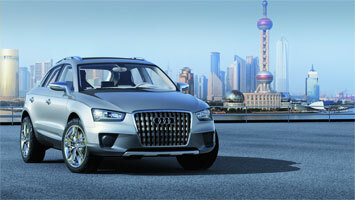 Debuting at the Shangai Motor Show, the Audi Cross Coupé quattro is a compact crossover concept vehicle that shows the latest evolution of the brand's design language and previews the forthcoming production model. The four-seat layout is based on the compact body of the A-class. 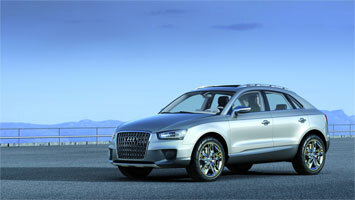 With a length of 4.38 m, a width of 1.82 m and a wheelbase of 2.60 m, it is only slightly larger than the A3 Sportback. The height of 1.60 m (18 centimetres higher than the Sportback) is typical of an SUV and gives the occupants an upright seating position. 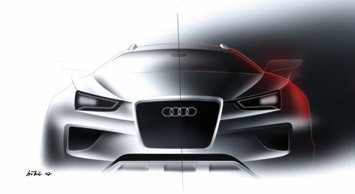 The silhouette is typical Audi; the design of the study, painted in Liquid Silver, is reminiscent of the sporty models produced by the Ingolstadt brand. A new element is the fabric folding roof. The Cross Coupé quattro is powered by a transversely installed four-cylinder inline TDI engine with common-rail fuel injection and piezo injectors. It delivers a power output of 204 bhp and 400 Nm of torque, an average fuel consumption of 5.9 litres of diesel per 100 km. The quattro permanent four-wheel drive system is combined with a Haldex clutch and the sporty S tronic dual-clutch gearbox, capable of executing gearshifts in few milliseconds. The suspension system features a McPherson-strut front axle and a four-link rear axle. Other technical highlights include ceramic brake discs, 20" wheels and a programmable drive select system, with three configurations for the engine, gearbox, steering and adaptive shock absorbers. 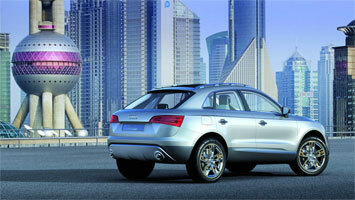 The Cross Coupé quattro will be unveiled by Audi at the At the Shanghai Motor Show (20-28 April 2007). 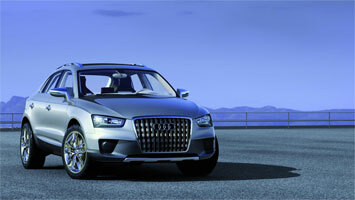 The design of the four-door study presents itself as a further step in the evolution of the current Audi style. The prominent single-frame radiator grille, the proportions, with large areas of metal and narrow glazing at the sides, and the powerful rear end identify the SUV as a relative of the Audi Q7. The robustlooking sill area with its colour offset and the heavily embossed dynamic line above it emphasise the vehicle's offroad character. The study, painted in Liquid Silver, has a heavily segmented side area with gently climbing shoulder line and accentuated horizontal rear end. 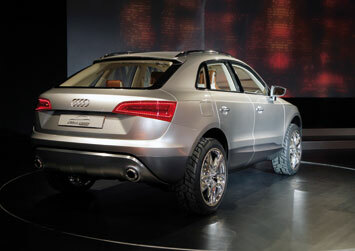 These elements are borrowed from the A5 coupé and are essential factors of this model's independence. 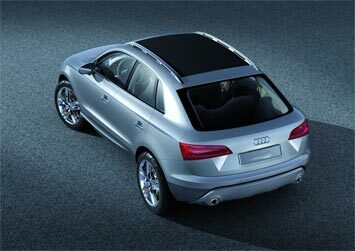 A typical Audi feature is the roof, gently curved and carried on the slim A and C pillars, evoking a coupé silhouette. Also typical of a coupé are the frameless doors with fully retracting windows. And the short overhangs also help to make the overall proportions appear so dynamic. As previously seen on the Audi Shooting Brake study, the trapeze of the large single-frame grille with its vertical slats gives the front end an emphatically selfassured appearance. Particularly eye-catching are the three-dimensional main headlights, which incorporate LED technology. The reflector dishes concentrate the light to form a powerful, uniform beamwith a white tone. Naturally, the daytime running lights, which take the form of a horizontal strip, also employ LED technology. In addition to its design qualities, this also provides for low level of energy consumption. 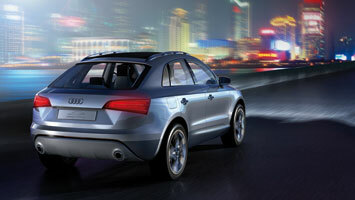 For the first time, the Audi Cross Coupé quattro employs LED technology for both headlights and cornering lights. Here, the lens, reflector and beam deflector are integrated in a single component. LED technology is also used for the mainbeam headlights. Viewed from the rear, the shoulder areas are especially prominent, separating the side areas from the D pillars. The tailgate embraces both the sides and the rear. The lights project deeply into both the side panels and the tailgate. The tailgate hinge is integrated into the roof rails. The tailgate itself opens up to reveal a wide, easy-to-load opening to the luggage compartment. 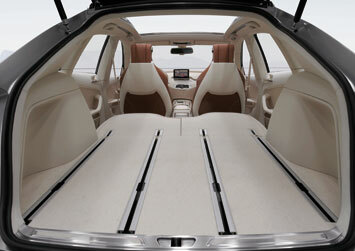 Here you can find the same multifunctional rail system that has been well proven ever since its debut in the A6 Avant. The volume of the luggage compartment is 450 litres when loaded up to the edge of the window. 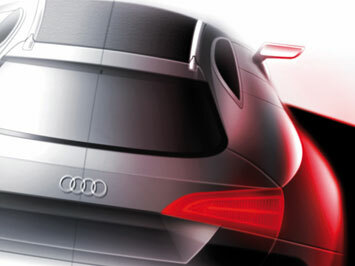 The rear lights are deeply embedded in the body of the vehicle, underlining the study's innovative design. The transparent red covers in a supine U-shape give a clear view of the LED technology. The pale basic colour, off white, generates an impression of quality and a feeling of spaciousness. In addition, clear contrasts between the different materials add to the visual and haptic surprises. Seating is provided by individual seats in the front and a rear bench with two fullsize seats. The complete seating system is upholstered in saddle brown leather. The cockpit area is heavily inclined towards the driver – typical of a modern Audi. The controls can be found here, while the front-passenger area is emphatically neat and architecturally clear-cut. In turn, the dashboard and doors are connected by flowing lines, while the cockpit itself is succinct and organically integrated. 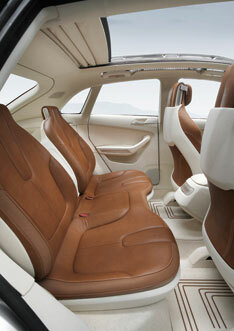 A new element is the perforated trim strip in the dashboard, linking the centre console and the front-passenger area. The perforated surface allows the air-conditioning system to provide indirect, draught-free ventilation through more than 4,600 holes. Another innovation is the MMI control panel, which is operated by a touch pad. The monitor of the system employs, for the first time, dual-view technology. The system can produce different images for the driver and front-seat passenger. These images are only visible when viewed from a specific angle. This allows the driver to read data from the on-board computer while the front passenger watches a TV programme, listening to the sound through headphones. The ambient lighting with numerous light sources gives the interior a stylish ambience, even at night. The large fabric folding roof can be opened and closed electrically. It opens up the view from the A pillar almost as far as the tailgate and across nearly the whole width of the roof.